Food contains the energy that powers the human body. Taste, sight and smell make it attractive, if hunger was not enough. The teeth and jaws reduce it in size and then it passes to the stomach. 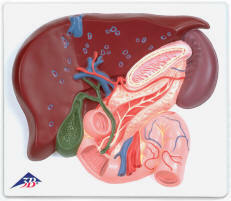 The stomach is the heart of the human digestive system, as it is both a food mixer and acid and enzyme bath. It squeezes the food into a semi-liquid called chime. 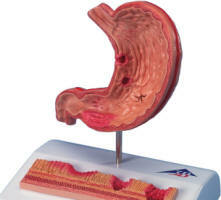 From there, it goes to the small intestine, where chemical digestion continues and most nutrients are absorbed. 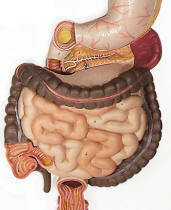 The large intestine forms the leftovers into brownish, semisolid masses, ready for disposal. The urinary system handles the liquid waste. 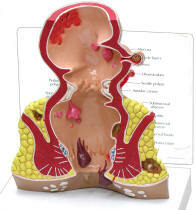 Our anatomical models show both the digestive and urinary systems. 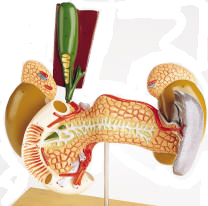 Other models concentrate on the primary organs, such as the kidneys, liver and gall bladder.